Do not use "Hardware Cloth!" - Your local hardware or home improvement store is likely to carry an inexpensive "screen looking stuff" that comes in various sizes, known as hardware cloth. Looking closely at it you will detect a lot of particles and little globs of solid zinc stuck to it. This item may work fine for rabbits, but it is dangerous for parrot-type birds as they can easily break off these toxic particles with their strong beaks potentially ingesting them. The problem with galvanized wires: Galvanized means iron / steel is coated with zinc, which is highly toxic. Please refer to Heavy Metal Toxicities in Birds. The wire used for aviaries and large breeder cages is generally galvanized wire. The most common hardware used on cages, such as nuts, bolts, chain, washers and quick links are either galvanized or zinc plated. Galvanized products are dull, plated products are shiny. Galvanizing is used to coat steel or iron with zinc. This is done to prevent galvanic corrosion (specifically rusting), therefore increasing the durability of a product. Therefore, birds are still exposed to the zinc. Particularly at risk are heavy chewers, but even non-chewers will be exposed to zinc resulting in heavy-metal poisoning if they grab the wires with their beaks. Removing the Zinc Coating: Zinc coating can be removed by soaking or sandblasting. However, once that has been done, the wire will rust quickly. To prevent that from happening, you would need to apply another protective finish to the wire, such as non-toxic paint (Please refer to the Green and Healthy website). Many breeders use galvanized after-weld wire as a cheaper alternative to stainless steel. Galvanized after-weld wire is a heavier wire and doesn't have the particles stuck to it. However, a problem that still exists with after-weld wire is rust. Any wire exposed to the outdoors will rust faster than indoor cages. As it oxidizes it will look duller and duller and eventually start to turn whitish in color. If you touch a piece of galvanized metal that has been left outside and the oxidation comes off on your finger - then a bird will just as easily lick it off when climbing on the cage, exposing it to toxic levels of heavy metals. To avoid that, breeders scrub their cages with vinegar and water twice or three- times a year. The scrubbing takes off some of the rust and the vinegar somehow retards new rust, but it can't stop it completely. And, of course, the vinegar wash won't last long if the cage is left outside. The only safe mesh is a stainless steel mesh. Stainless steel is more expensive, but it won't rust. You can get it at Home Depot, Lowes or most local hardware stores. It is typically found in the screen door section. They will also sell fiberglass or aluminum screens - so please be sure to ask for stainless steel mesh. PVC coated wire has a thin layer of plastic coating which is very easily removed and chewed on by our birds. Therefore, it is only a good choice for non-chewing birds, such as finches and softbills. Powder coated wire is a cooked on coating which is more difficult for our parrots to remove and this is what is most often used on commercially available bird cages. It's a bite more expensive than PVC coating but is also a lot sturdier than PVC coating. Use untreated wood only! Treated wood has been penetrated with pesticides to keep insects out. Highly dangerous for birds - even more so for chewers! Disinfect / clean the wire carefully and check the cage for any sharp edges before putting any birds into the newly built cage. Type of Cage: Determine the type of cage you plan to build. Choose the material. Decide whether the cage should be free-standing (in which case you would need legs), whether you would like it to hang from the ceiling or whether you would like to place it on some sort of stand (in which cases you don't need legs). Dimensions: Plan the dimensions of the cage according to the size of your bird. For a bird like a macaw, plan a bigger cage, i.e. - 18 inches wide x 18 inches long x 18 inches high (minimum size for very small birds only). Two-bottom Cage: The best cage is one in that has 2 "bottoms." The top one allows the bird's droppings to fall through to a second one to keep your pet from coming into contact with its droppings and spoiling food. You can make a pull-out bottom for the second one to facilitate cleaning. Relevant mostly for outside cages / aviaries: When building a bird cage to be kept outside, you need to take into consideration that you will need to keep the wildlife out. Outside cages have to be very sturdy. You will need to provide adequate shelter taking into consideration your local weather conditions: Your bird will need shade in the summer and protection from inclement weather, including potentially having to provide heat in the winter, if it gets cold in your area. To keep predators out, it is recommended to place an outer layer (consisting of the cheaper wiring is fine -- or plastic panels) to prevent them from reaching in or getting access to your birds. Raccoons especially can reach in with their finger-like paws (as they like to do) - birds get spooked and flatter all over the aviary - ending up on the floor. Eventually the raccoon can get hold of it and pull the poor parrot close enough to basically pull of chunks piece-by-piece. This also happen when you place your parrot outside in a regular cage -- or a hanging cage. The hanging cage allows the raccoon easy access through the floor grate. Plastic netting is definitely not a good choice for the outer barrier. Predators can easily tear through it and larger parrots may chew holes in it as well. Recommended is at a minimum a 14 gauge 1" x 1" grid wire. A 16 gauge may work for most parrots; although you need even stronger wire for larger parrots as they may be able to chew through that. Wood Frame: Buy plain, untreated wood and cut it into four proportionate pieces. The bigger the better. Remember that you have to accommodate perches, food / water dishes, toys, maybe a nest box -- and still need to allow plenty of room for your pet to roam around inside the cage. 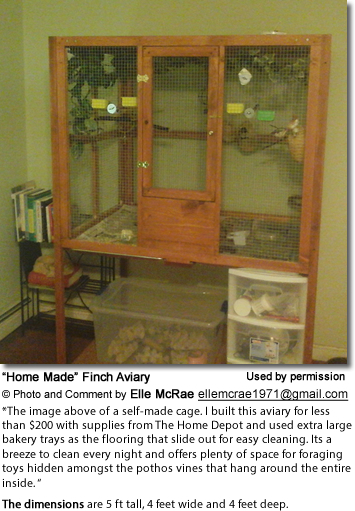 An appropriate size for small birds (budgies, cockatiels, finches, conures, etc.) would be 1x1's, 1x2's or whatever size wood you want. (Outside cages need to be stornger than indoor cages.) Legs would be a larger size wood, i.e., 1/2 x1" or 1x1" or 1x2" wire for smaller parrots. Apply a non-toxic paint and varnish to both sides and let it dry completely. Affix wire to the sides, top, and bottom by using a staple gun. Alternatively, you can wrap the wire all the way around the frame and affix with staple gun. Then make top and bottom. All-wire Cage: It is best to buy a roll of chain-link fencing wire or mesh wire.Choose a specific pattern that easily holds perches and toys but is narrow enough to prevent the bird from getting out or getting its head stuck. Remember to disinfect / powerwash the wire - to remove any metal pieces and contaminants. You can build a cage without wood by just bending wire and then cutting an opening for the door and using some of the wire to make a door. Alternatively, cut the wire into four equal sized pieces for the sides of the cage. Use a staple gun to attach the wire to the wooden stand. For the top and bottom of the cage, cut two more pieces of wire and attach as described above. If you are making a cage with sides: 2 feet wide, and the top and bottom: 2 feet wide - each piece of wire should be cut to 6 foot. In the end, you would have 2 pieces of wire 6 foot long. Bend one piece of the wire you cut to the length of the cage and then bend the remaining wire for 1 side. Take the second piece of wire you cut and do the same thing. Then put the 2 pieces of wire together to form a cage. You can attach them to one another with cage clips. Using cage clips requires a special tool to make it easier. You could use pliers to affix cage clips (this special tool can also be found where cage clips are sold). You could also use electrical ties to hold a cage together - however, larger parrots usually chew the electrical ties off. Some people send their galvanized cages to a shop that does a powder coating type of paint job. However, zinc tends to be a poor paint primer. The best situation would be to take any raw iron wire in to be nickel plated, and forget about zinc and paint altogether. If you are going to have a bird cage sandblasted and powder coated make sure the new powder coating is formulated lead and zinc free as needed for a bird cage (powder coating designed for say the automotive industry might contain lead or zinc which are toxic to birds). The process is rather straight forward: all metal surfaces are sand blasted, then heated and sprayed. Note that the hinges and locks can't be powder coated - so those will still rust. Doors: Cut an opening on the front side of the cage for the door. Then cut a piece of wire a bit larger than the opening and affix one side to the cage. Make sure the door opening is big enough to allow yourself space to easily clean the cage. Put a bolt or a small lock outside the door. Affix the door with cage clips or electrical ties, etc. If you plan to breed the bird later, make another hole on one side of the cage and secure it for the time being. Should you decide to paint your cage, go for "child-safe" paints. You can get those at Home Depot. Final Steps: Place food dishes and a perch inside the bird cage. Install a pull-out cleaning tray underneath the cage.